Tyler Alvarez is an American actor. 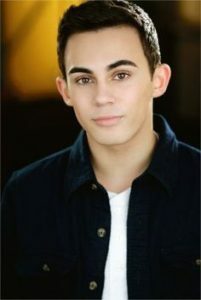 He is best known for his roles as Diego Rueda in the Nickelodeon’s teen sitcom Every Witch Way and Peter Maldonado in the Netflix’s mockumentary series American Vandal. He also portrayed the role of Benny Mendoza in the Netflix’s comedy-drama series Orange Is the New Black (2015–2017), and played the role of Declan Rivers in the ABC Family series The Fosters (2018). Born Tyler Sage Alvarez on October 25, 1997 in The Bronx, New York City, New York, USA, to a Cuban–American father and a Puerto Rican–American mother, his parents got divorced when he was a child. His older brother, Nico, passed away in October of 2018. He also has two younger half-siblings from his father, Brianna and Alex, and a younger half-sister from his mother, Sophia. He was educated at Fiorello H. LaGuardia High School and at Jericho High School. He is fluent in English and Spanish. *He was born on October 25, 1997 in The Bronx, New York City, New York, USA. *Started acting classes at the age of ten. *He speaks English and Spanish fluently.